Grant Nisbet is a songwriter in Sydney Australia; he has a strong spiritual faith and explores the journey our souls take in life and death through music. Grant has always had a love of music but it was not until the age of 40 did he commence piano lessons. After a short period he was encouraged to explore song writing and found a new element of music he had never considered before. After the passing of a friend in 2015 Grant reached out to music to heal the grief, but never found that special song he was looking for. It was shortly after he commenced writing Our Hymns that was later recorded by Stacy Hogan (producer) and Mike Lusk (Vocalist). Grant sees music as a journey in life and likes to acknowledge two special people that became part of the journey for Our Hymns. Helen Kennedy (music teacher) who encouraged Grant to start writing music, and Darryl Chute (Fountain Head Studio) who worked with Grant to record the first version of Our Hymns. Grant hopes to continue on with his journey and writing songs about the soul. Our Hymns embraces the power of faith and love through songs. It takes you into the world of loss and grief when we say our final farewell to those we have loved on earth before they ascend to the heaven. 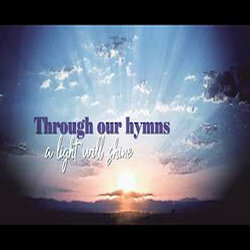 Our Hymns unites grief and love that touches our souls so we can let another soul go.